CM: Etymologically, 'ephebe' in ancient Greek is a youth at the bloom of his/her lifespan - between 18 and 20 years of age. This work is one of a long series of what Costas Klouvatos calls 'chromo-shedia' (color-drawings). 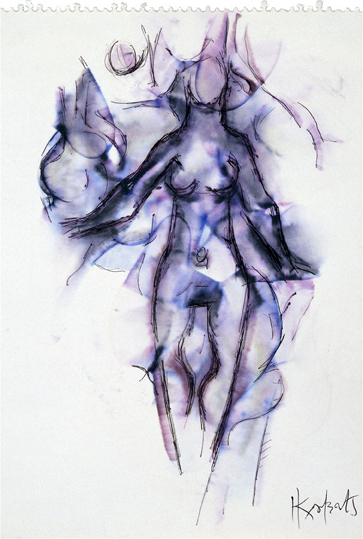 The centre of the drawing is occupied by an abstracted figure, which is clearly female. Beyond the figure are more lines that suggest folds of drapery surrounding the figure. These features are - according to Klouvatos - 'Sybantikes Grammes' (universal lines), suggestive of the powers and forces in nature that are otherwise invisible to the physical eye, but are perceptible in metaphysical terms. Interestingly it is the washes of color that contain the lines rather than the lines defining areas of color.